“Please hold on to the seat in front of you as we expect some turbulence”…definitely not the reassuring message from the pilot you hope to hear when you are already a bit jittery on a sixteen seater propeller plane, landing in the harrowing airport of Lukla, the town nestled in the Everest region in Nepal. After safely landing on the runaway which leaves no margin for error as it terminates in mountainside, I exhaled deeply and pried my fingers off my neighbors seat cushion before deplaning and collecting my belongings. So began our final leg of our 2013-14 Empower Nepali Girls volunteer visit. In the afternoon, we visited the first school, like most of the schools here while struggling for materials and teaching aids, it’s rich in scenery set atop a hill with sweeping vistas of the Himalayas and step-farmed valleys. The whole school of pupils were perched on walls and benches as we presented the 10 or so ENG girls in this area with their backpacks and scholarships. 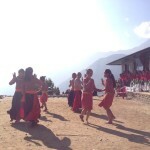 Different students performed some dances while we sipped tea in the warm sun and crisp mountain air. After the presentation, our group divided into smaller groups to visit the homes of most of the girls. I noticed one young girl casting a few awkward glances and smiles my way, but I couldn’t quite place her, until it dawned on me that last year we had recruited and spent time with some new girls in this area and this young girl, Pema, was one I had really connected with. But in just one year the change in her was nothing short of astounding. Last year, her circumstances were dire, her father had left her family and her mother unable to make ends meet could not provide for Pema, so Pema was living without a home (Pema was just 9 at the time). When I met her then, she clutched her raggedy red jacket for warmth, her tattered shoes barely covered her feet, and while her hair and face were unwashed and disheveled, it couldn’t hide her endearing smile and sparkling eyes. Last year when most of the other kids had at least one parent with them as we met the girls to determine their fit with ENG, she was alone. An amazing family nearby took Pema in that year. Today, the young girl smiling shyly at me was nothing like I remembered. Dressed smartly in her school uniform, her hair neatly trimmed and brushed, she spoke English with confidence and she proudly swayed her head (in that subcontinental manner of saying yes), when I asked if I could visit her home. 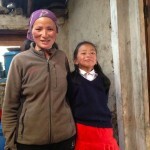 Her mother had improved her situation and Pema had moved back to be with her and was now attending a different school (still supported by ENG). She had walked 45 minutes through mountain trails to attend the ceremony today, so we traversed back to her home where I met her mother, filled with pride of the accomplishments of her daughter. Pema ran to her room and brought out her most recent report card and some English workbooks showing me how much she had learned and how much she loved being in school and having this opportunity for basic education so many of us just take for granted. As her mother steeped tea for me (and my Sherpa guide who had accompanied me), Pema and I wrote together and played pictionary. I promised her I’d be back to see her again and that I’d want to see her continue to work hard and take advantage of her education (she smiled broadly in agreement). Before I left, I took a few pictures with her mother, and she dashed off to get me a kata (white scarf symbolizing gratitude), and stood in the pathway waving goodbye until I couldn’t see her any longer. I recount this because it was an experience that truly moved and touched me more than any other yet on this trip. The tangible impact of the difference we can each make in someone’s life has never more profoundly affected me then today. I’m proud to be part of ENG, and to have family, friends and co-workers who have all contributed to ENG in spirit of changing the world. I’ve seen what is (and will be) possible. Copyright © 2014 Empower Nepali Girls Foundation, a 501(c)3 organization. All Rights Reserved.